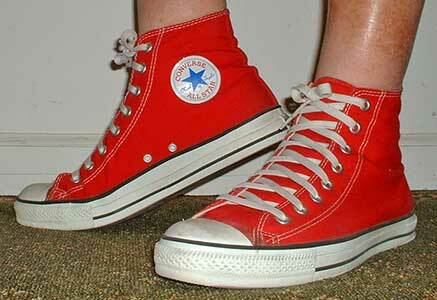 People wear red high top chucks to make a statement. As much as you may love your chucks: airing your feet from time to time may be a good idea too. It probably creates stinky feet  no matter! 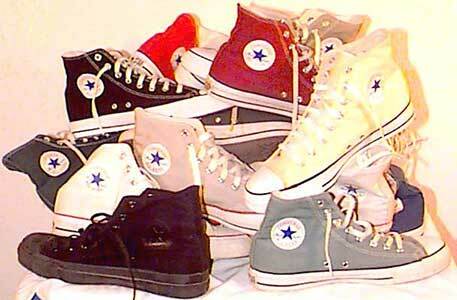 The Converse All Star Taylor, nick-named “chucks”, is the most successful shoe model of all times. So far, over 600 million pairs have been sold, and with each box part of the myth is delivered over the counter. A classic? Pure understatement. The Converse All Star Chuck Taylor is the classic. If the term “cult” hadn’t degenerated over the years by indiscriminate senseless use, then chucks would be just this: a cult object. A shoe of simplest working that seems to fascinate the youth culture again and again. Originally designed as a basketball shoe it was developed into today’s format in 1921 in collaboration with the US basketball player Charles “Chuck” Taylor who gave it its name. Outside of the courts, though, chucks served the baby boomers in the 70s, the punks in the beginning of the 80s, the apologetics of the grunge in the 90s, and the New York protagonists of the big “The”-bands rockwave since 2001 as stylish footware that wasn’t in danger of being symbolized to pieces by short-lived trends and well funded late bloomers. The shoe wears out much too quickly, and especially in its light fabric version is hardly kept in a state of orderliness that would please mother. This decay is, of course, desired according to the old three-step subculture plan: (relatively) cheap price, symbolic ambiguity, rebellious myth. On top, chucks offer the potential to differentiate and separate oneself — a big concern to the youth — in two ways. On the one hand the wearer of the shoe — irrespective of any sales rates — can still be sure to belong to an indigenous youth culture that recognizes each other as a minority in super markets, trains and cafes. Depending on color choice it more or less wears the label rock’n’roll with its subcategories unreasonableness, excess, anger, style and broken sexiness. On the other hand it is possible to position oneself much better within the wide variety of the chucks than is possible with any other shoe brand because the wearer can choose among a multitude of different models and colors and so differentiate himself from other owners of the same brand. A strange logic at first glance, to wear the same and something totally different at the same time. Nonconformity in the conformity of nonconformity. To put it differently: the possibility of individualism under the circumstances of peer pressure. The wearer of low cut, possibly almost immaculate red chucks wants to make a different statement than someone who wears down his heavily tattered white or black high tops. Knee-high brown leather chucks symbolize something totally different than high tops models with hippiesque applications and friendly colors. The variety of models and therefore stylish statements is virtually unlimited. If this is not enough, you can go to the homepage of Converse and have your own model with your own combination of color and cut made. The shoe becomes the field of a game, a painting book and the projection screen of one’s identity. With chucks, you can choose from a wide variety of colors and models. The huge success of chucks is based on three pillars that have almost nothing to do with each other and for this very reason ideally support each other: Standing out is the sensation of restriction for the wearer due to the, measured by the average foot, exceedingly narrow foot rest that turns the shoe into a second thick skin, and gives the wearer literally a footing and secure stand even in shaky and unsteady situations like dancing and drinking alcohol. Add to this the endless myth that the shoe has acquired in the sports and music culture (especially on the feet of countless rock and pop stars) since 1917 which conveys to one generation of youth after the other the feeling of being part of something authentic, something reliable for all days. Something that cannot be tamed, something that for ever and again unfolds its rough symbolism. And all this despite the third pillar, which is the financial power and the marketing know-how of the international shoe manufacturer Nike who, in 2003, incorporated the ailing footware producer Converse for 305 million US dollars into its empire. Sure enough, the sales succes is also due to the fact that because of their narrow foot rest chucks don’t last long. Whereas children and teenagers can still spend years with one pair, you will seriously meet clearly older professional youngsters in the flagship stores of Converse crying “exchange, please” every two months, to buy the exact same shoe that has just proven its suboptimal adaptation. And they do this for years. It would be no problem, of course, to obtain studies about the width of the foot of the average population and to improve the shoe accordingly. But to the followers of the shoe this would surely be treason because a more stable version wouldn’t fit the image of the unadjusted and slightly ruinous. Since Nike has been pulling the strings for chucks, the model has been in high demand. Prices have increased, and the product range, formerly more or less restricted to the colors red, blue, white, black and sand, and to low cut and high tops, has been widely expanded. With success: while old customers still bank on their accustomed shoe models, there are more and more wearers who have no relation to the original myth of simplicity and punk and yet still buy the shoe. Neon green, pink and sequined models are especially favored by very young girls of all social classes and cultural groups. Aggressively colored and gummi bear-cute chucks are cheerfully worn with big earrings and belly baring tops for a bottom rocking R’n’B evening. The classical white toe-cap has been replaced with a pointed version by resourceful designers, and even high heels have evolved from the simple basic model. Everything is possible, and instead of reduction of the very simple shoe, you now find opulence and diversity. Nike will be glad; new groups of buyers have entered the market. It is doubtful, though, if the traditional customers are equally pleased. But if there is one shoe with the potential to bear up against these contradictions and discrepancies, it is chucks. Daniel Erd wrote this article for the German newspaper Sonntag Aktuell.